October is one of my favorite months. The air is crisp enough to wear a light, trendy coat - not smoldering hot or freezing cold, pumpkin everything is everywhere, the colors of all things are fantastic, and you can totally watch The Nightmare Before Christmas on repeat from the beginning of October through the end of December and no one will think twice. One thing that has never managed to scare me, however, is a book. Books have made me cry and laugh and feel all sorts of emotions, but never really fear. So, this month, I'm focusing on books that have been known to make readers leave a nightlight on and check their closets before going to bed. At least twice. We'll see if they live up to the scariness for me. I'm rather desensitized to most scary things (by the last Saw movie, I barely even flinched), so I'm up for this challenge. 1. The Diviners by Libba Bray - This book sounds and LOOKS awesome. The cover is so beautiful. I've been told Libba Bray is a wonderful author and that this novel is particularly creepy. Plus, it's about supernatural happenings in the 1920s in New York City. Yes. 2. The Unbecoming of Mara Dyer by Michelle Hodkin - Another book I bought because the cover was so gorgeous. I'm not entirely sure what this one is about, but I've heard nothing but good things. I've also heard it's sure to scare. 3. The Shining by Stephen King - King is the master of horror. And I've never read him before. I figured this was a good place to start. Especially since it's sequel, Doctor Sleep, just came out - 30 years later. How cool?! Also, the edition I have is from the 70s (courtesy of my mother). I think of all the books, this one might actually have the power to freak me out. Do you like being scared? 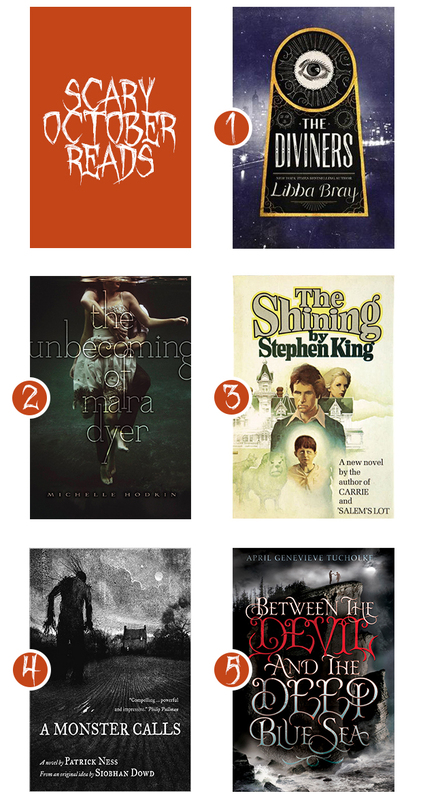 Do you have a favorite scary book? Please recommend them in the comments!